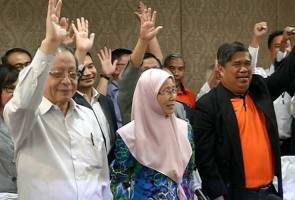 SUBANG JAYA: Pakatan Harapan, a new Opposition coalition, has been formed to replace the now defunct Pakatan Rakyat. The coalition comprised three political parties – Parti Keadilan Rakyat (PKR), Democratic Action Party (DAP) and Parti Amanah Rakyat (Amanah), Opposition Leader and PKR president Datuk Seri Dr Wan Azizah Wan Ismail announced today. She said the crisis that is currently sweeping the country has pushed the opposition parties to unite in facing the upcoming 14th General Election (GE14). When asked about PAS’ involvement in the new coalition, Wan Azizah stressed that Pakatan Harapan is only made up of the abovementioned three. “Keadilan, DAP and Amanah. That is it for now. NGOs are not part of Pakatan Harapan,” she told a media conference after chairing the Opposition round table meet here today. She explained that PAS was invited to join today’s round table meet but the Islamic party declined. According to the Permatang Pauh MP, a special committee comprising the secretary-generals and selected reps from each party, would convene in the near future to fine tune the terms of Pakatan Harapan, such as the common policy, ethics and cooperation among the parties as well as a collective agreement. The statement that was read out by Wan Azizah today was co-written by DAP's Lim Kit Siang and Amanah president Mohamad Sabu. Also present today were Amanah deputy president Salahudin Ayub and committee member Dr Hatta Ramli, PKR deputy president Mohamed Azmin Ali, vice presidents Nurul Izzah Anwar and Rafizi Ramli, and DAP's Anthony Loke and Tony Pua. Meanwhile, when met by reporters later, Rafizi, who is also PKR sec-gen, explained that the difference between Pakatan Harapan and Pakatan Rakyat is that the new coalition will have a document that binds the component parties together. He said the document which will outline the terms of the coalition, can be renegotiated if any other party want to join. Previously, PKR had tried to get PAS to be part of the new coalition but the Islamic party had rejected the offer profusely, saying it could no longer work with “party traitors” and the DAP. PAS had deemed Amanah as traitors for pinching its members from PAS, while the DAP had openly severed ties with PAS president Datuk Seri Abdul Hadi Awang over the hudud issue.